The 6.6 x 6.6" Graduated Sunset 3 Filter from Tiffen is an exciting filter. It enhances reality, adding a touch of subtlety or drama to the image. When you can't get to the southwest for that awesome sunset, this filter will come in handy. Your friends will think you were on assignment for a travel magazine. Sometimes it is also desirable to add color to part of the photograph. For example, to add an orange/yellow tint to bump up the effect and punch of the sky. Tiffen Color Graduated filters are half-color, half-clear, with a graduated transition for blending into the scene. Tiffen Graduated Sunset filters are available in grades from 1-3, with 3 having the greatest effect. 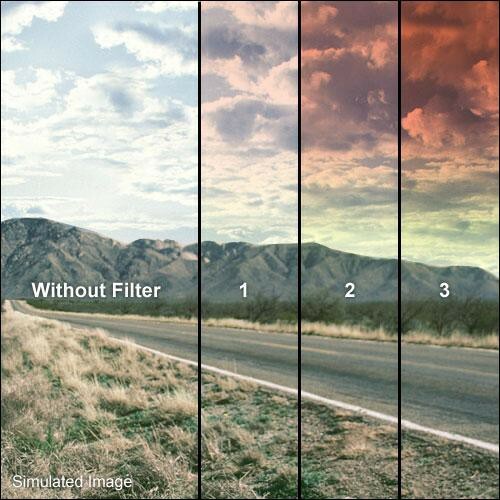 The Graduated Sunset 3 filter will provide a multi-layered sunset effect with a red sky blending down into orange and then yellow, with the bottom of the filter clear. Dramatic sunset effects can be created even using the lightest version of this filter. The 3 version generates the maximum effect for this filter and should be used when an extreme appearance is desired to the image.